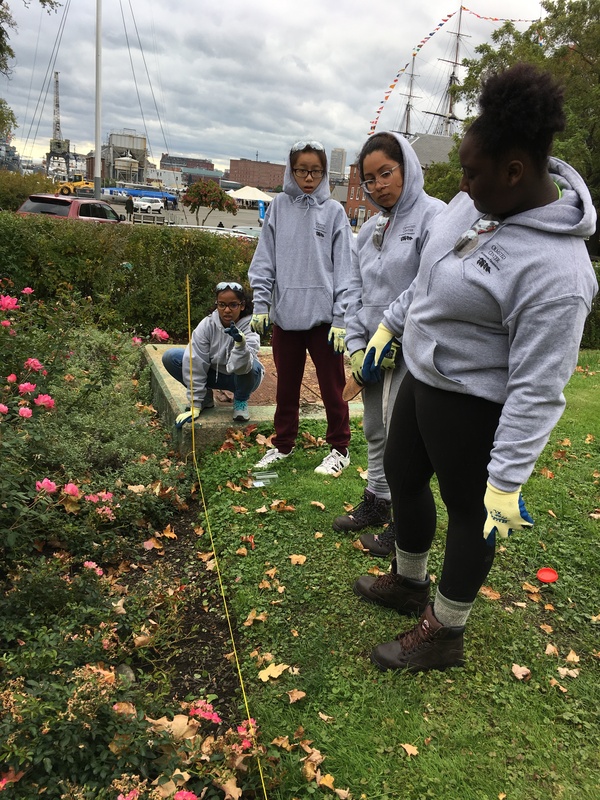 One of the first projects we worked on was doing some maintenance on the commandant house garden in the Charlestown Navy Yard. The Navy Yard was where naval ships were built, repaired, and maintained. The commandant house is where the highest ranking military officials stayed during the 1800s. The building of the house was completed in 1805 and renovations continued until 1835. Since the Navy Yard was decommissioned in 1974, the house has been kept for historical preservation. We, the Branching Out Student Ambassadors, worked on the garden to keep up it’s maintenance. We got to learn about the different techniques used to keep a garden healthy and growing. One technique was weeding, which was to keep the garden from growing unwanted plants, and keep the other plants growing strong. We also worked on mulching the garden which helped keep weeds from growing in the garden. We also used an edger not the garden which was to separate the commandants garden from the rest of the surrounding lawn. All these techniques were to prepare it for the coming winter. We also worked on the victory garden by winterizing the high-raised beds. Teamwork makes the dreamwork! Our crew edging the garden bed. Laxmi sharing with the team how to set the line and properly edge a bed. Some of the highlights from working on the commandants house garden was being able to work outside and have a hands-on working experience. This was also our first experience working together as a group. Some challenges of working on the garden was that it was a lot of physical labor, and took lots of tedious work to get the project done. Mulching the garden proved to be a bigger challenge than any of us expected, but with all of us working together, we eventually got it done. Although this project was not a simple task, it was a great team building experience, and also a lot of fun. Finishing the garden maintenance and winterizing the garden was a huge accomplishment, and we were all proud of the hard work each of us had put into keeping this garden beautiful and healthy. Great job! That garden really needed you help to get it back to the condition that the former Branching Out team created.